Adster has been diligently installing SSL certificates on clients’ websites. Unlike our senior developer, I’m not skilled enough to run scripts on Adwords to change all our URLs to HTTPS, and since these SSL certificate installs have been rolling out slowly, I’ve been tackling ad URL changeovers as they are done. For all you non-devs out there, I’ve written a quick and easy way to change over your ads in five minutes or less using the beloved Adwords Editor. I can quickly abort my operations if I make a mistake. I can easily pick and choose which ads I would like to update and pause. It makes bulk editing sitelink extensions easy peasy. 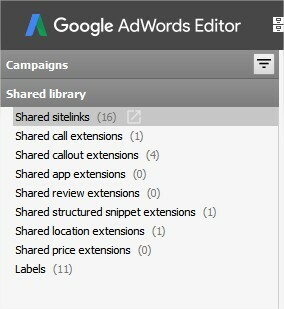 Using the Adwords Editor, download the account whose ads you would like to edit and navigate to your Expanded Text Ads. 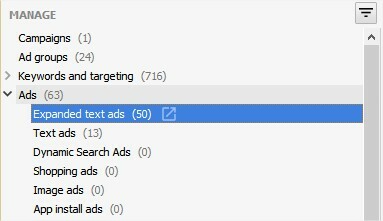 Select all your active Expanded Text Ads and click on “Replace Text”. I like to check off “make changes in duplicate items” and pause the old ads, but that is your preference. If you don’t check off that box, then the previous ETAs are simply removed, though you can still view historical data in the account (Update: With the new Google Ads interface, ads are no longer removed, another version is simply saved. You don’t necessarily need to make a duplicate ad anymore.). Another reason to pause, not remove, the old ads is you can then wait to pause old ads until the new ones get approved. It might be helpful to label the new ads when they are created to quickly filter if so. Unfortunately, this will not work for Standard Text Ads as they are no longer editable. In order to change those ad URLs, they will have to be upgraded to Expanded Text Ads. Don’t forget, you’ll also need to update your Ad Extension URLs such as your Sitelink Extensions. Navigate to Sitelink Extensions by clicking on Shared Library in the lefthand navigation bar. 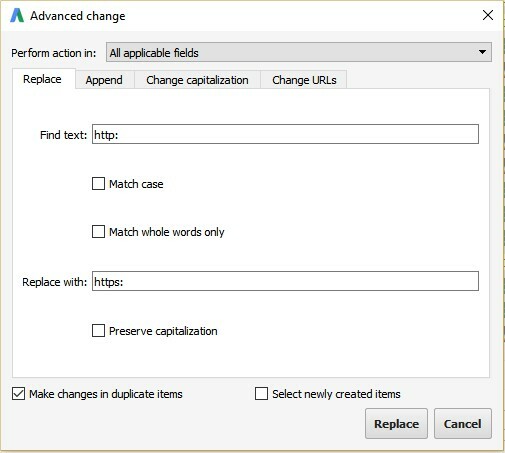 Again, highlight all your Sitelink Extensions and click on “Replace Text.” I actually don’t mind making changes directly instead of creating duplicate items as Adwords does not remove the past Sitelink Extensions if you change the URL. To finish it off, hit “Check Changes” in the Editor and then “Post” for those changes to be uploaded to your account. Don’t forget to check your account in the Adwords interface to ensure there were no errors. Voila! Changes made – ads updated.